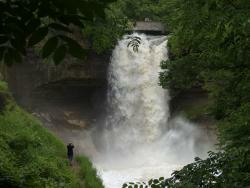 Minnehaha Falls: Recent heavy rains have made the Minneapolis attraction even more attractive.Courtesy Mark RyanThe effects of the recent spells of hard rain will still be felt this week as flood conditions persist in Minnesota. The old single day record for rainfall at the Minneapolis-St. Paul Airport was shattered last Thursday (June 19, 2014) when 4.13 inches fell. On a personal level, we've never had water in our basement in the 20 we've lived in our Minneapolis home until after last Thursday's deluge. The seemingly constant rainfall has prompted me to make several trips to one of Minneapolis's favorite landmarks: Minnehaha Falls. Normally a tame, relative trickle during the summer season, it has been a roaring torrent of late, making it quite the spectacle to see and hear. And if just the sight of it doesn't blow your hair back, you can do like this Tennessee wild man and go over the falls in a kayak! But that's just crazy - and dangerous - so I'm not really suggesting you do it. Plus it's probably illegal. Local rivers will continue to rise for the next several days so who knows what it will look like later this week. it`s a little intresting how it was made and how all the pictures were captured, and what happened in this flood.